"Trailing the 'Indiana Harbor' "
Aboard a small cruise ship exiting the east end of the locks at Sault Ste. 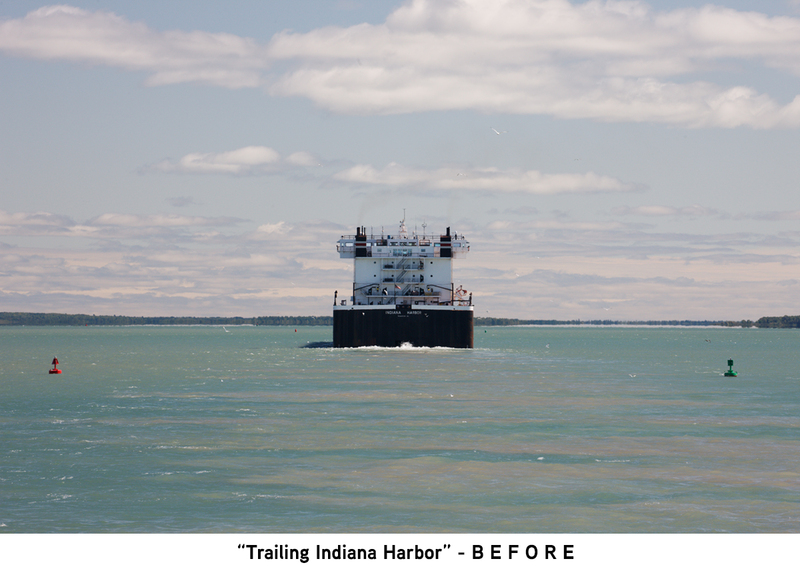 Marie, Michigan, we trailed the Indiana Harbor - at 1000 feet (305 meters) long and 105 feet (32 meters) wide this iron ore/coal carrier is one of the largest ships on the Great Lakes. I loved the symmetry and color in this composition: the red and green buoys, the ship dead center, the balance between water and sky, the blue of the lake mixed with the color of silt stirred up by the ship's propeller. The image posed an interesting color-management challenge. The color temperature in the BEFORE shot was unappealing. I didn't like the strong magenta tones in the sky and superstructure of the ship. 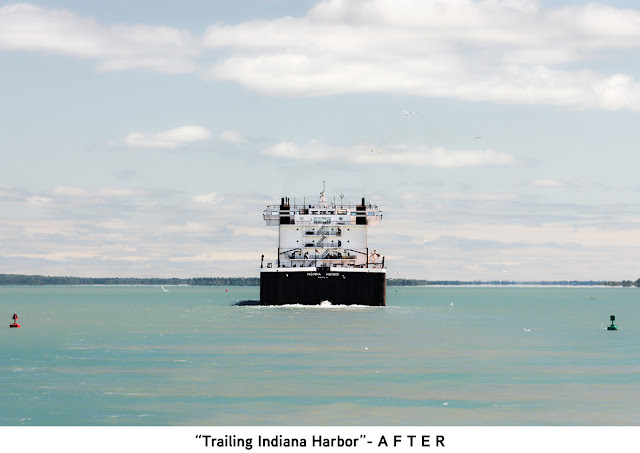 I adjusted color balance with the eye-dropper tool in DxO PhotoLab, using the white band at the top of the ship's hull as the white reference. This worked for the top part of the photo, but I didn't like the resulting color of the water, so I did a separate white balance adjustment for the lower half of the frame, using the white froth of water in the ship's wake as the reference point. I then combined the two sections in Photoshop. Using fine contrast adjustments, I reduced detail in all parts of the photo except for the ship, making the water and sky look slightly hazy. Conversely, I used fine contrast adjustments in the opposite direction to enhance detail in the ship's superstructure. The BEFORE image was under-exposed throughout. I corrected this with an exposure adjustment to the RAW file and tone curve adjustments. I cropped the image slightly to remove uninteresting space at the bottom and sides of the frame.